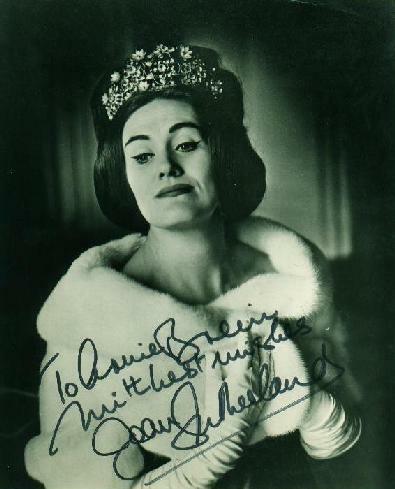 I read yesterday’s paper with a degree of sadness as the esteemed Mr. Tommasini chronicled the passing of the great coloratura soprano Joan Sutherland and details of her memorable career. It is a worthy article if you haven’t read it, the link is above. “La Stupenda” was my generation’s answer to the great Callas, Joan Sutherland’s death is a loss . I will always love her best as the noble Norma, her “Casta diva ” was thrilling me all of yesterday as I battled Los Angeles traffic. Thank you dear Joan, we will miss you. This entry was posted on October 13, 2010 at 10:09 am and is filed under 20th century, Joan Sutherland, Opera, Recquiscat in Pace. You can follow any responses to this entry through the RSS 2.0 feed. You can leave a response, or trackback from your own site.